Brian the Engineer and I were going to a wedding at The Boathouse in Central Park, and the invitation requested "black tie optional" attire. As of one week before the wedding, I had no idea yet what I was going to wear. 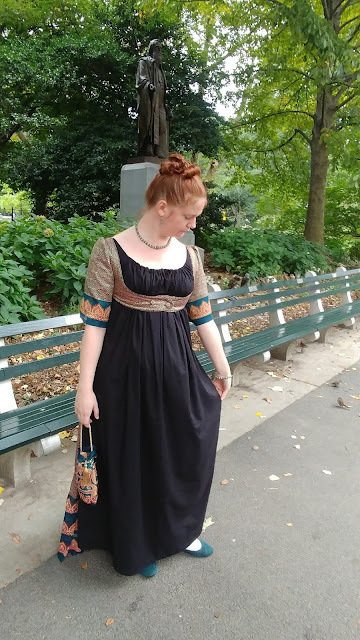 My plan was to make a dress from my stash, as I have several patterns and fabrics set aside for modern dresses that I never get around to sewing because I'm always working on historical costumes and/or clothes for Reptar. I also needed to finally add the tail pockets to his black wool tailcoat, since I had made it rather hurriedly for a ball four years ago and never actually finished it! I got it to a wearable state for that ball, and added sleeve linings and properly finished the cuffs for the next ball - two years later. The tail pockets were missing this whole time, and it felt really good to get those on at last! Which made dancing rather difficult! The sleeves were tight when I first made the gown four years ago, because I only had a very small amount of fabric with the edge trim, and I was determined that the sleeves would have the trim! And they've only gotten tighter as I've steadily gained weight over the past three years. 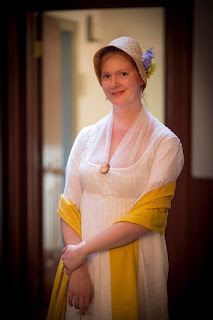 When I wore the open robe at the Regency Ladies' Retreat, I could barely get it on - even with assistance. So I was definitely going to expand the sleeves before I wore it again. Fortunately, I kept ALL of the scraps from the sari when I made it in the first place, intending to use them to make a matching reticule someday. 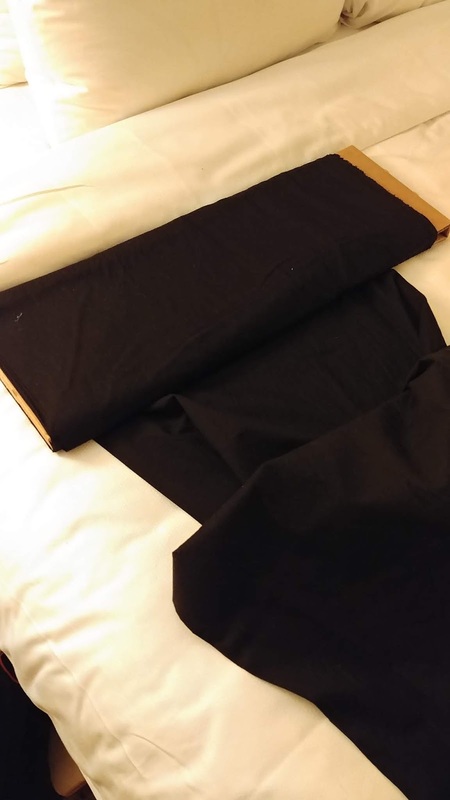 I dug those out, and found that I had a couple of pieces of border trim that I could piece together with pieces of the main fabric and insert into the sleeve seam. I planned to open up the armscye a bit, as well. With most of this important sewing done, I packed up my (backup) sewing machine and we left for New York. We had a long drive, so I could do some hand sewing in the car. I hemmed Brian's trousers and attached the buttons, so they were done. Once we got to the hotel, I pulled out my machine to patch my stays over the busk pocket where it's starting to wear through, and I suddenly realized that I had forgotten to pack both my white bodiced petticoat and my Sheer Striped Gown! So I had NOTHING to wear under my Open Robe! We were eight hours from home, in the middle of Manhattan, and the wedding was in 14 hours. Luckily, I had - on a whim - brought along a bolt of black cotton in case I got all of the essential sewing done and still had time to make Brian a new black cravat. 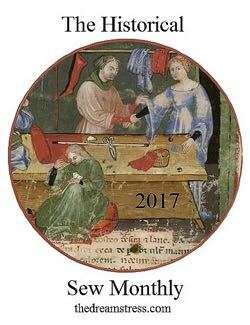 By an amazing confluence of events, I had everything I needed to make myself a drawstring underdress! 1. I had a little over 4 yards of fabric on the bolt, and I'd brought the entire thing rather than just cut off the length I needed for a cravat because I was short on time. 2. I could reverse-engineer the bodice pattern from the Open Robe, which happens to be the same pattern I had used when making two previous drawstring dresses, so I knew how to do it and - more importantly - I knew that I COULD do it. 3. 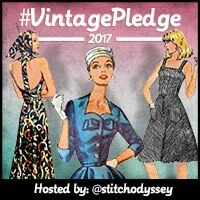 The fact that I had removed the sleeves from the Open Robe and had not yet reattached them made the pattern drafting much easier! 4. I had brought along a roll of 1/4" twill tape so I could make the tie at the back of Brian's trousers. 5. I had the sewing machine, black thread, scissors, and pins. After that first picture, I ended up shifting the entire piece over to the very edge of the fabric, to maximize the amount of fullness at the front neckline and waistline. And I cut a full width of the fabric to match the skirt front at the side seams. This got gathered in to the back piece at the waist. Then I cut bias strips for the drawstring casings. I even managed to make a quick reticule! You can see how much more room I have in the sleeves now! White Apron-Front Dress: Apron-front closure - adjustable fit! Dove Gray Dress: Drawstring closure - super adjustable! Sheet Striped Gown: Drawstring closure - super adjustable! 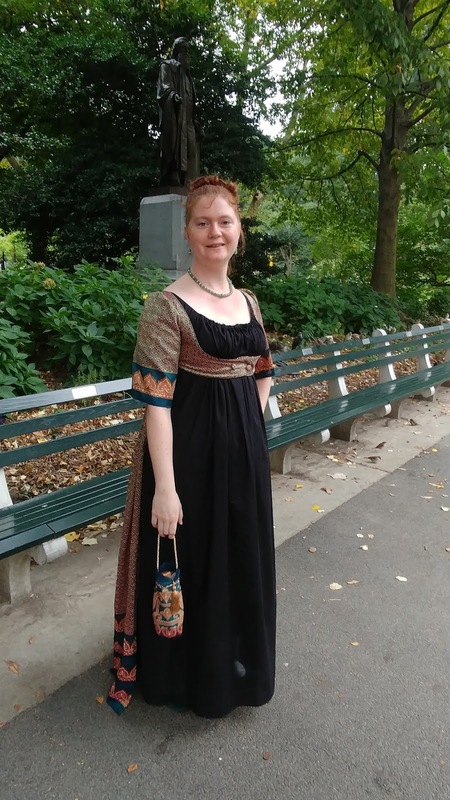 So I had plenty of options for daywear, but only one evening gown that still fit! 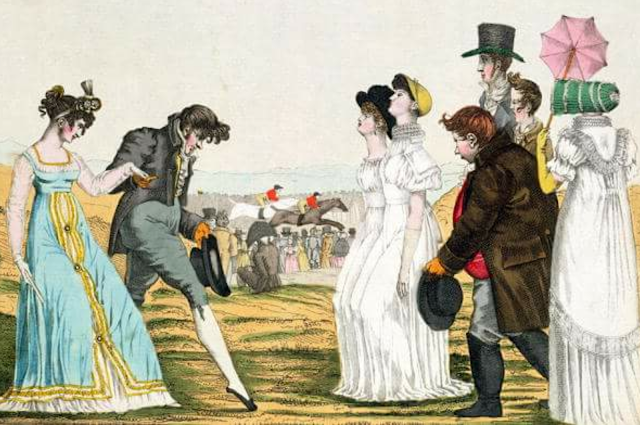 And it simply wouldn't do to wear the same gown two evenings in a row. What to do, what to do? 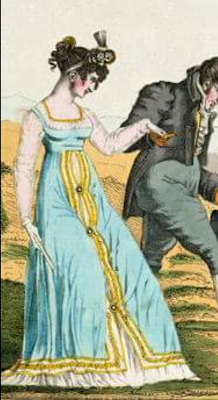 Oh wait, do I have a huge stash of fabrics, some of which are waiting specifically to be made up into Regency dresses? Turns out I do! Did I have the time to make one? Well, it was Wednesday evening, and the retreat started on Thursday afternoon. However, I would not be arriving until Friday morning because Brian the Engineer was away on a business trip until Thursday night, and I needed to wait until he was home to take over watching Reptar. So that gave me all of Thursday to sew! No problem, right? I saw this print after somebody posted it on Facebook, and took a screenshot with my phone. It jumped out at me because I had JUST bought eight yards of a really nice tissue silk in that exact shade of bright sky blue! So clearly I had to make it (the dress on the far left). Could it be done? It was 11:00 PM on Wednesday when I settled on starting this crazy project. I planned to wear the completed gown on Saturday evening. I could certainly finish it at the retreat, but I didn't want to spend the entire weekend sewing - like I did at the first retreat in 2015. 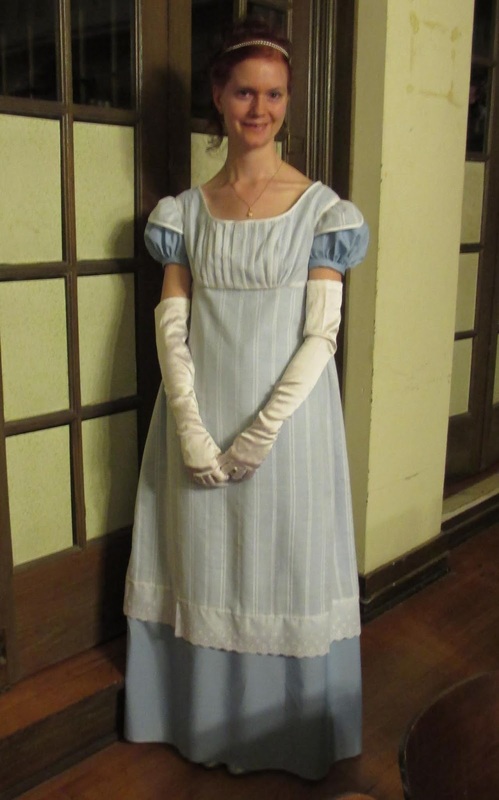 I started with a mockup, using my tried-and-true generic "Regency bodice" pattern that I drafted four years ago. 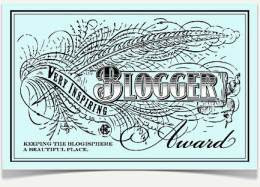 I've gotten a lot of use out of it since then! I zoomed in on the gown in the screenshot on my phone, and kept it handy while I worked. I also grabbed some Dove chocolates to munch on while working, and this was the wrapper of the first one I ate! I put on my stays in order to fit the mockup properly. I had cut a generous center front allowance on both pieces, which I pinned together for the proper fit. I had left the center back as a single piece cut on the fold, because I wanted to keep the same dimensions in the back when converting it to a center-back closure. This mockup was just to get the front fitted properly. Ignore my messy sewing room. I had forgotten to add extra length when I cut out the center back piece, so I measured how much I needed at the side back seams and added it when cutting out the lining. I also added two inches at the center back, to account for the closure. I also added about half an inch of height to the front neckline, to make sure it would cover my stays. Then I needed to do some math. I had one length of a white cotton/poly blend that I had taken from the lining of a curtain that I had cut up for another project, and I wanted to get the underskirt with a ruffle from it. I tried to snip and rip the silk, but it didn't want to rip! At least not in the direction I wanted. Irritating. I ended up pulling threads and cutting to get the length, instead. Then I whipp-stitched this down over the seam. With the bodice finished (as much as it could be without a proper fitting, for which I would need another person), it was time to get back to the skirt. I found the center of my length of fabric, snipped the selvedge (hem) and pulled threads up the the cut edge (waist). This gave me a straight line to build the center front decorations on. 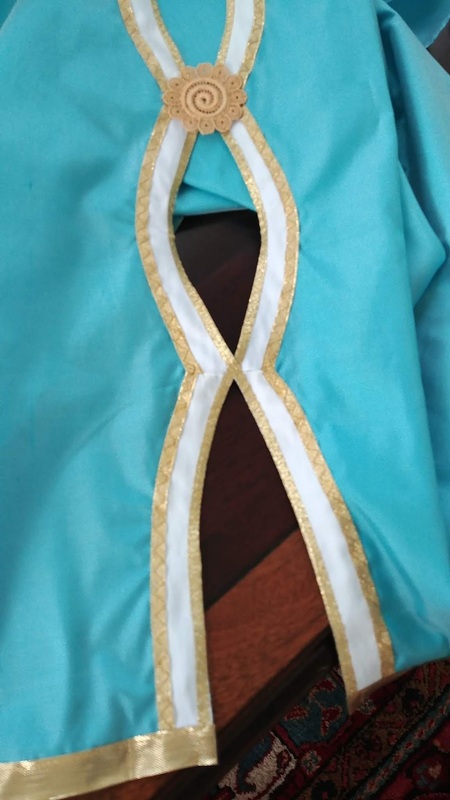 I wanted five segments of gold and white trim that met at center front, with the fifth one open at the bottom. My finished skirt length would be just over 35", so I wanted each segment to be 7" long. I decided to do this as appliques instead of applying trim to cut edges that would meet in front. This way I could be sure that my two sides were even. Now it was time to add the trim! 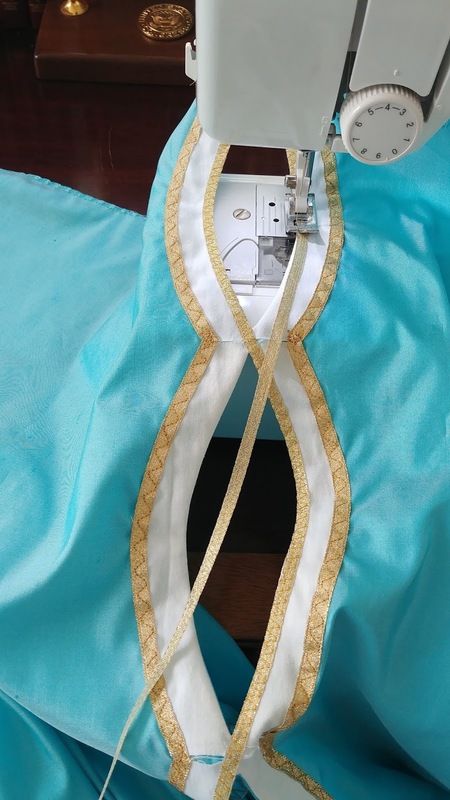 I had sorted through all of my metallic gold trim before starting this project, and figured out which of each kind of trim I had enough of to go around the outside of the front segments, around the inside of the segments, and around the hem edge. They would be three different kinds of trim, but all worked well together. I used the darning stitch on my machine, which is basically a zigzag but with multiple stitches across both ways. This made it easy to attach the ribbon in one step, instead of stitching down one side and then going back down the other side. And it helped me to gently curve the ribbon around the edge of the applique to make it lay smoothly. If I were doing this project with less of a time crunch, I would have stitched down the edges of the applique first, then covered that stitching with the gold trim. I probably also would have sewn the gold trim by hand. But I did not have the luxury of time with this project! This was already nearly midnight on Thursday night, and I was leaving Friday morning for the retreat. But I did get all of the gold trim attached to the outer edges of the front segments before I went to bed. And hey! I have gold tempera paint! 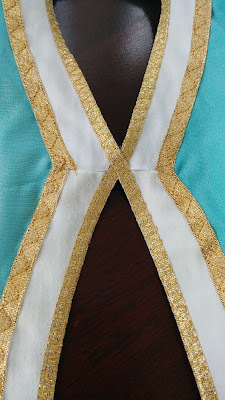 Oh, I also added the gold trim at the hem edge. 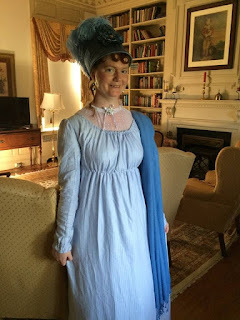 Friday morning, I packed up all of my Regency clothes, shoes, and accessories, along with everything I needed to finish The Mad Dress. I also brought my backup sewing machine, which is much more lightweight (and much more basic) than my good old Bernina. I knew I would need to do some handsewing at the retreat, but I wanted to do as much by machine as possible. I stitched down the darts from just below the bust to the waist, leaving them free on the bust itself. I made hand-sewn buttonholes and attached the buttons after we had our afternoon tea. (Which was delicious!) Then I set up my sewing machine and finished attaching gold trim. I had a spool of ribbon that was very similar to the pieces I used for the outer edges, but narrower and a slightly lighter gold color. On the inner edges, it was easy to attach it in one long piece, switching sides at every juncture. Then I went back and did the opposite sides in the same manner. Finally, I tacked the gold lace medallions in place by hand. Attaching the skirt by machine was so much faster! And it's finally looking like a dress! I left it for the night, as it was time to dress for dinner. After dinner I was scheduled for cleanup duty, so I knew I wouldn't be doing any more sewing until the next morning. But there was only one thing left to do - attach the underskirt. I pleated it and pinned it in place along the opposite side of the bodice seam allowance as the blue skirt. This would encase all of the seam allowances between the two skirts, and give me the option of removing the white underskirt for cleaning if need be. Slight flaw in my plan, though - I forgot that the blue skirt was open in the front, and the seam allowance now showed through! I did not do The Mad Hairstyle to match, but perhaps someday. I do want to make the sheer long-sleeved chemisette that the image appears to show her wearing, however. And I would like to add more volume to the underskirt - I have more curtains I can disembowel! The buttons were selected by committee. I borrowed the tiara from my friend Megan for the evening. And I was quite pleased to pair my gorgeous aquamarine Dames a la Mode collet necklace and earrings with this gown - it's as if they were made for it!